The initial game at the Marist School Gym was won by Imus Bandera-Glc Trucks & Equipments (72 points) against Marikina Shoemasters (71 points). With missed layup and follow up rebound in the final nine seconds of the game, the Marikina Shoemasters’ final score of 70 against 71 of Imus rendered the Marikina team losing by a heartbreaking one point in the Maharlika Philippines Basketball League (MPBL) held at the jampacked Marist School Gym last night, the 4th of July. This leaves the Marikina Shoemasters on a standing of 1 win, 2 loses in the league of 26 teams competing in the Datu Cup of the MPBL. In an earlier match at the Marist School Gym, team Muntinlupa Cagers won with a final score of 85-69 against Zamboanga Valientes. 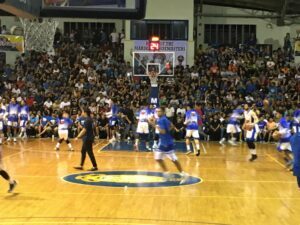 The Marist School Gym was packed with over 2,000 basketball enthusiasts watching the first MPBL games on July 4, 2018. The Marikina Shoemasters will practice and play their scheduled games at the Marist School Gym during the MPBL season. Visit https://www.facebook.com/officialmpbl for the MPBL schedule of games and team standings. 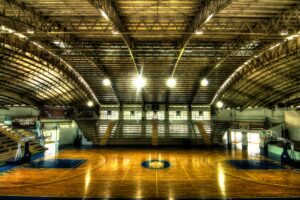 The Marikina Shoemasters has chosen Marist School as their home court for the Datu Cup during this year’s MPBL first full season (with national scope). The partnership pact was signed between Marist School President, Br. Niño M. Pizarro, FMS and Mr. Marvin Manzon together with Mr. Elvis Tolentino (Head Coach), Governors of Marikina Shoemasters with the endorsement of Marikina City Mayor Marcy Teodoro and Marikina District 1 Congressman Bayani Fernando. Sports development is one of the flagship programs of Marist School for the holistic development and character formation of its students. Marist School is equipped with sports facilities such as athletic oval for soccer, baseball and athletics; multi-purpose gym; two covered courts for basketball, volleyball and badminton; two lawn tennis courts, Olympic size swimming pool; multi-purpose function rooms ideal for table tennis, chess and other indoor games. Marist School athletes are competitive in various leagues in the local, regional, national and international arena.